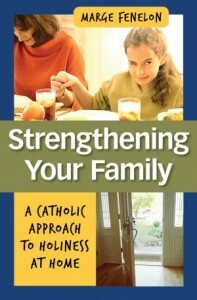 Donna-Marie Cooper O’Boyle recently interviewed Catholic Lane columnist, Marge Fenelon about her new book, Strengthening Your Family. DONNA-MARIE: Marge, your new book Strengthening Your Family is lovely! It seems a lot different than the others of yours I am familiar with. Can you please tell us why you decided to write this book? MARGE: Yes, Donna, Strengthening Your Family is different. All of my books offer insight and inspiration, but this one is more practical in that it offers parents guidance for what to do and what not to do. The idea was brewing inside my heart and mind for a long time. All around me, I see families – both young and old – struggling to raise their kids to be productive, enthusiastic Catholics. I see new couples unsure of how to get off to a good start in educating their children to holiness. I also see couples that are yearning to be closer, more united, and more spiritual. It was time for me to share the wisdom my husband, Mark, and I have gained over the years as well as wisdom we gleaned from other families. DONNA-MARIE: It’s wonderful you have offered the wisdom that you two have gained so that others will benefit. What are your hopes for this book? MARGE: My hope is that the book will act as a catalyst that sparks a fire for sanctity in families everywhere. I worked in the pages of Strengthening Your Family to meet people where they’re at, help them appreciate and accentuate what they’re already doing that works, encourage them in their desire to do better, and instill in them the confidence that they really can do it. DONNA-MARIE: Can you tell us a little about the writing process for this book? MARGE: Concept-wise, a lot went into this book before I even began the writing process. The idea was swirling around in my head for quite some time, but…what to do with it? I didn’t want to do something preachy and know-it-all, but I did want to offer solid content that folks could count on. Mark and I assist in the formation of young couples, and so we’ve got a good deal of experience under our belts and a sizeable amount of resources at our disposal. Of course, my wonderful children ever so kindly reminded me that Mark and I are not the perfect parents (like I didn’t already know). That made me realize that the book had to be a composite of wisdom, not a first-person account. Once I’d gotten that far, I had a chat with Bert Ghezzi at Our Sunday Visitor. He liked the idea and felt certain the book would sell. We hashed things out over a series of phone calls and emails and eventually came out with something workable. I owe Bert a huge thank you for all he’s done in championing my book! Writing-wise, I’m a front-to-back writer. I’ll mull the content over and over in my heart and mind until I can “feel” it. While I’m driving, doing laundry, and especially exercising, I’ll be piecing things together. I might jot down hand-written notes (yep…we’re talking pencil and legal pad) as I go along. That can take weeks or even months. Then I put hands to keyboard and away I go. I do a three-step edit and revision. This book was more challenging than the others in that it contains a far greater number of quotes and passages from outside sources – saints, popes, Church documents, and the Catechism. That required quite a bit of research! Each time I sit down to write, I edit and revise what I wrote the previous day. Next, I’ll edit and revise each chapter. Finally, I’ll go back and edit and revise the whole manuscript. Each writing session begins with a prayer to the Holy Spirit for wisdom and ends with a prayer of thanksgiving to the Blessed Mother. DONNA-MARIE: Could you please tell us about your spiritual mentor that you mentioned throughout the book and how his spirituality applies to the family? MARGE: Most of what Mark and I know about spirituality, marriage, and family life we learned from Fr. Joseph Kentenich (1985-1968), Servant of God and founder of The Apostolic Movement of Schoenstatt. Fr. Kentenich founded Schoenstatt in 1914 in Germany and since then it’s become a widespread and internationally known Catholic lay movement of moral and religious renewal. It’s based on a Covenant of Love with the Blessed Mother under the title Mother Thrice Admirable and the Schoenstatt Marian Shrine (there are more than 270 throughout the world) as a place of grace. The two foundation stones of Schoenstatt’s method of formation are love and freedom. Fr. Kentenich spent the years 1951-1965 in the United States, during which time he worked almost exclusively with families. Because of that, he’s left behind an absolute treasure trove of materials for individuals, couples, and families who find themselves rocked by the turbulence of the times and need surer footing on the path to sanctity. I can honestly say that, without the support, formation, and education I’ve received from Fr. Kentenich via the Schoenstatt Movement, I would not be the faithful Catholic, wife, and parent that I am today. Nor would I have been able to write Strengthening Your Family! DONNA-MARIE: Is there anything else you’d like to share about this book? MARGE: Yes, thanks for asking. I think there are three important assets of Strengthening Your Family of which readers should be aware. First, families of all ages – beginners, those in the thick of it, and “veterans” – will find the book helpful and inspiring. Second, both new and experienced couples will find the book helpful and inspiring, too, as I devote quite a number of pages to the husband-wife relationship. Third, holiness is attainable – for everyone! DONNA-MARIE: I wholeheartedly agree, especially with your third point! Finally, Marge, where can we get your book? DONNA-MARIE: Thank you very much for your time. I pray that your book will inspire and spark “a fire for sanctity” in countless families!